Who’s hiring now? Come find out! ¿Estás buscando un nuevo empleo? 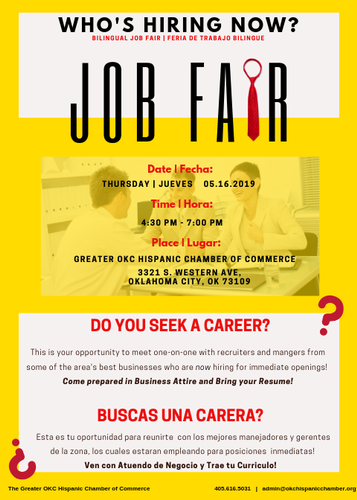 Join the leading resource for Oklahoma's Bilingual job seekers. There will be several companies looking for Bilingual Employees. Bring your resume and be ready to interface on the spot with some of the best employers in OKC! There is no cost to come and meet with the participating companies. Please bring your resume, dress professional and be ready to meet with your prospective employers. If you would like to have a booth at the event, please use the register button.